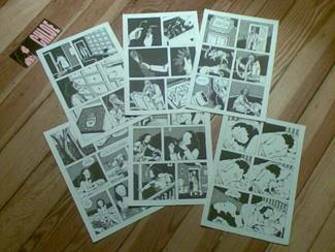 In a desperate effort to raise funds to escape Philadelphia, I am now offering the original pages from my 2001 Xeric-Winning graphic novel, CHLOE for purchase. (I am also using this as an opportunity to try out PayPal.) The pages are listed HERE and are priced accordingly. Each page will be mailed to any area within the U.S.A. in a flat cardboard envelope with no shipping charge. Adorn your home with a unique piece of cartooning perversity, or conceal your newly-obtained treasure in your precious vaults! Frame it or deface it with your own doodles! Give it as a gift to your stranger relatives or discerning friends! Don't delay: they are available only first come - first served basis!